“In our small town, my sister Poppy and I were the only people we knew who were adopted,” said Sasha Thomas. “Our biological mother – from a Russian immigrant family with the last name Oshianko – put us in foster care at ages one and two. Our foster parents adopted us and told us that we were chosen specially by them. I grew up thinking that adoption was a wonderful thing. “I trusted Christ at an early age and am thankful for His grace in that. When I went to college, God provided godly people around me who helped solidify my relationship with the Lord. I got a degree in music and eventually went to Nashville to become a professional singer. While the music profession never materialized, God prepared the way for greater things. “In 2000, I had the opportunity to serve at orphanages in Russia. I always had a heart for orphans, and many friends stepped forward to help me get there. In Russia, I was surrounded by people who looked just like me and my sister. Inside the orphanage, I questioned whether I could make a difference. Given my ‘perfect’ American lifestyle, how could I offer hope to kids facing deplorable conditions? But as I handed out Bibles, I discovered that God uses individual believers to change lives. I shared with many orphans the only thing that could never be taken from them – a relationship with a perfect, eternal, Heavenly Father. “After moving to Dallas, I became part of Watermark. Over the next eight years, I worked myself into a hole, struggling to balance my career and personal life. The Lord brought me a community of friends who helped me see my struggle with control. Trusting God was the only way to find purpose and peace. That’s a lesson I continued to learn as God brought me into the next chapter of my life. “As I mentioned before, I’ve always had a heart for adoption. So when a friend asked if I’d go with her to an ‘Intro to Adoption’ class at Watermark last spring, I went to support her. God used that event by Watermark’s Tapestry ministry, which serves families who are considering foster care and adoption, to open my heart to bringing a child into my home. 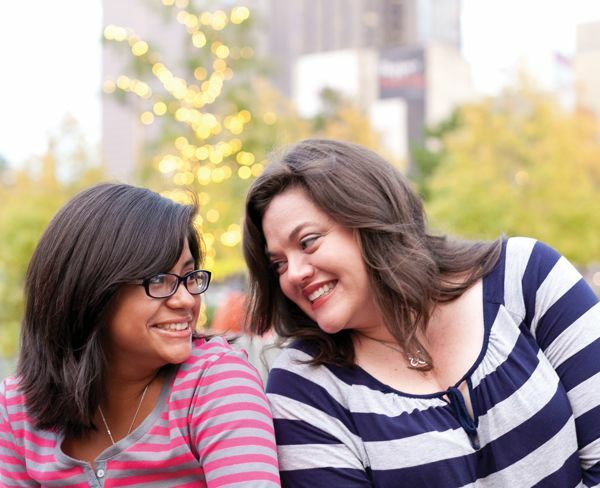 “I became certified for Matched Adoption, and not long after that, the Lord brought a 10-year-old girl named Vanessa into my life. She is quiet and introspective, but also very creative and funny. Vanessa loves and is able to be loved in return. The more I got to know her, the more I wanted to step in and be part of her life. “The first day she spent in my home was November 11 of last year. It’s such a joy to see her light up when she discovers something new. She’s doing well in school, and she’s gaining confidence as she adjusts to our new life. All she wanted was someone in her corner who listens and supports her. I’m thankful that the Lord gave me the opportunity to do that. “Six months later, I was legally allowed to finalize the adoption. Of course I wondered if I was truly prepared. The job is too big for me to rely on my own judgment, so God brought people into my life to equip me. The Lord shaped me into the person He needed to parent Vanessa. “It was a great celebration at the courthouse the day Vanessa officially became my daughter. Our family, friends and community were on hand when the papers were signed. Vanessa is now getting involved in community through a junior high small group at Watermark. She reads her Bible, wanting to know what it all means and how to apply it to her life. The post ADOPTED appeared first on Watermark Community Church Blog.